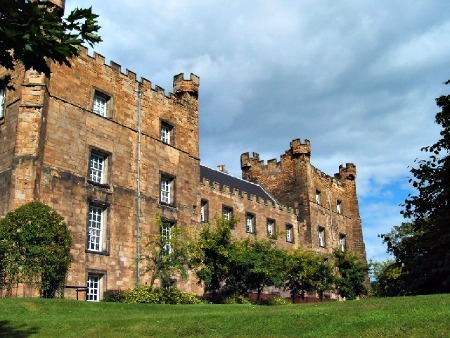 Lumley Castle was named after its creator, a man named Sir Ralph Lumley who turned his manor home into a castle after returning from wars in Scotland in the year of 1389. He wasn't able to enjoy his new home for very long as he was implicated in a plot to overthrow Henry IV and was executed, with his property being forfeited to the Earl of Somerset. However the lands came back into the hands of the Lumley family when ownership was reverted to his grandson Thomas in 1421. The castle took an interesting turn in its function during the 19th century when it became a hall of residence for the university college of Durham, with the students who lived here being known as "castlemen". This went on until the 1960's when the university college sold the building to fund the halls of residence in Durham in order to keep all the student on the same site. It is still honored by the student today with the bi-annual "Lumley run". The castle has also long been the seat of the Earls of Scarbrough, and they officially own the property to this day. In 1976 they allowed the management of the building to be conducted by a hotel company who turned it into 73 bedroom hotel, which it remains as such to this day. Lumley castle is believed by many to be the most haunted places in county Durham, though this is as always hotly debated between the different paranormal investigation groups. The most commonly encountered and widely known ghost is that of Lily Lumley. She was the lady of the manor during the 14th century ad the story goes that she was murdered by two catholic priests who became angry at her when she refused to take up the catholic faith. The two priests took her out into the grounds and threw her down a well, were she died shortly after the fall. When she started to haunt the castle isn't known exactly, as records on this sort of thing were often sketchy if they were even kept at all. But people have reported seeing her ever since the days its doors opened as a hotel. The castle is a favorite spot for various cricket teams and it was the Australian cricket team which got the castle in the headlines for its hauntings in the year of 2005. The team reported strange activity in their rooms and refused to sleep in a room on their own, with one of the team member's being so scared by something he actually ran to the reception in nothing but his underwear. In 2000 the Indian cricket team had a similar experience, with the whole team checking out of the hotel early because they were to scared to stay there another night. Lily is thought to be a somewhat gentle spirit, with most claims consisting of seeing her float silently down corridors of standing in a room staring at the floor before fading away a few seconds later. The other ghost at the castle is known as "Black Jack" and is thought to be a mischievous spirit. He has been known to slide glass's off tables right in front of guests in the bar area, as well as tugging at peoples cloths from behind, perhaps for the enjoyment of seeing the look on their faces when they turn round to see nothing.